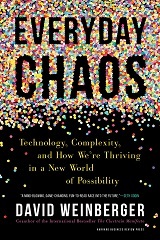 David Weinberger, a senior researcher at Harvard's Berkman Klein Center for Internet & Society, has written a new book, titled Everyday Chaos: Technology, Complexity, and How We’re Thriving in a New World of Possibility. Weinberger will showcase Everyday Chaos (Harvard Business Review Press), available from Amazon on May 14, at DBTA’s upcoming Data Summit conference at the Hyatt Regency Boston (May 21-22, 2019). According to Weinberger, machine learning’s importance is not only in the benefits its use brings, but also in how it is transforming our understanding of how the world works and our most basic strategies for dealing with the future. At its most basic, Weinberger said, “We've traditionally thought about the future as consisting of possibilities that narrow down as they come closer to us in time." He says our basic approach for thousands of years has been to try to make sure that the single possibility that we want is the one that survives the cut, primarily by anticipating what will happen and preparing for it. The result is that this is changing the way people think about the future. In essence, Weinberger said, “We're seeing value in opening the future up, rather than trying to narrow it down. That is an epochal change." He turns to the role of machine learning, which, he claims "is providing us with a different way of understanding how this opened-up future works." "Traditionally, we've tried to predict and manage the future by discovering the general principles that govern it. We use this knowledge to build conceptual models that identify the controlling factors in a domain and how those factors are interrelated. But machine learning doesn't work that way. However, machine learning sometimes uses models that are far more detailed, intricate, and complex than humans can comprehend. There are some data scientists who say that we are on our way to solving that problem while others disagree, he observed. “The price of all this predictability may be human understanding,” said Weinberger. At Data Summit 2019, Weinberger will consider the implications of these facets of machine learning and explore what it means for society and our moral sense of the world, and be available to sign the new book. Weinberger will present his Data Summit 2019 talk, “How Machine Learning Is Changing the Future as a Fact and as an Idea” on Tuesday, May 21, 2019, from 4:15 pm–5 pm.